Gilgit Baltistan benefits from a unique, rich and diverse nature. Yet, its biodiversity is seriously threatened by climate change. Climate is not a stationary phenomenon, it varies from time to time. It is a product of weather which always experiences variations over space and time (Rasul, 2012). Climate change is resulting from a growing concentration of Greenhouse Gases (GHGs) and uses of fossil fuels and other anthropogenic activities has become a major worldwide concern (Khan, etal 2012). Anthropogenic activities affect the atmosphere and climate in the course of air pollution of greenhouse gases and aerosol, particulate matter, and through land changing. Anthropogenic emissions of GHFs like CO2, CH4, (CFCs) and nitrous oxide have has led to increases in their atmospheric concentration and cause warming of the lower atmosphere (Rosenthal,. et al 2007). The Gilgit-Baltistan (GB) of Pakistan formerly known as Northern Areas (NA) Pakistan has a unique and vital role in sustainable development of Pakistan. GB has geographic range of an area of 72,971 km² (28,174 mi²), lying in the extreme north of Pakistan (75 08 48.12 E & 37 00 47.33 N to 77 41 11.82 E & 35 27 26.06 N) (Khan 2012). Nature has gifted this area with high mountainous ranges, massive glaciers, glorious rivers and splendid valleys and full of precious and industrial mines. Gilgit-Baltistan serves as a major water catchment for the Indus River Basin (IRB) upon which majority part of Pakistan depends for hydroelectrically and for irrigation proposes. Gilgit-Baltistan is a politically sensitive location because of its special territorial status. And are administered directly by the Government of Pakistan (GoP) (IUCN 2003). It borders with Afghanistan’s Wakhan Corridor to the north, China to east, Khyber Pukhtunkhwa (KPK) province to the west and India to the south east. The region is divided in to seven districts; Gilgit, Skardu, Hunza-Nagar, Ghanche, Ghizer, Diamer and Astore. Gilgit-Baltistan has an estimated population approaching 2000,000. The regions administrative headquarters are located in Gilgit city. Gilgit-Baltistan is rich for biological diversity. It contains most important forests, extensive mineral resources and host for many endangered species of the world. The Gilgit-Baltistan is dominated by one of the most important landscape on the world, joint by Hindu Kush to the west, Karakorum to east, and mighty Himalayans to the south and Pamir to the north. It contains 101 peaks which are found to be above than 7,000 meters (IUCN 2003) like Nanga Parbat, K-2 (Mt. Godwin Austin) the second highest mountain after Mt. Everest. The mountain valleys of GB are usually narrow, profound and steep in appearance. The high mountains are behaving like resistance to the monsoon rains to reach in GB. That’s why most of the places in GB receive less rainfall and are fall cold desert. Natural beauty, largest mountains, unique biodiversity, topographic difference, and a larger variety of cultures and languages have been a good concern for scientist to conduct research in Gilgit Baltistan. Climate changes and its impact on biodiversity is currently an important issue of whole world. In Gilgit-Baltistan, some NGOs like World Wild Fund (WWF) has been struggling to protect and conserve biological resources of the GB, and are wishing to implement the adaptation and mitigation strategies for the Gilgit-Baltistan. Like other mountainous area of the world, climate changing is also taking place in Mountainous areas of Pakistan such as in Gilgit-Baltistan. Climate change is posing serious threats to the fragile ecosystems and poor communities. All most all the natural ecosystems are vulnerable to climate change in GB. The rapidly melting of glaciers causes habitat loss of many species and it causes damage in migratory routs of many migratory species. In Gilgit-Baltistan the climate stations in Gilgit, Skardu, Gupis and Bunji show increase in the total temperature in last two decades from 1980 to 2006 which has been observed increasing by 0.440 C per decades (Khan and Ali 2011). 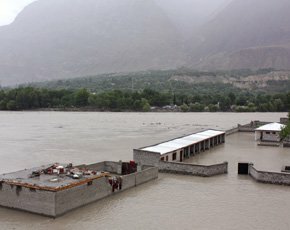 It was discovered that change in climate caused flash floods and river bank erosion in Skardu district GB. The flash floods emanating from glacial melting and leading to river bank which causes erosion and flooding of fields (WWF-P Brochure 2012). The impact of climate change is expected to increase in future. Most of the species are moving towards poles and to higher elevations (FRANCO, etal., 2006). The general overview about the climate change and their associate hazards in Gilgit-Baltistan are loss of habitat, species extinction, less grasses in pasture, pest attacks, increased frequency of glacial melting, high turbid water, cold spell, GLOF, and destruction of water bank infrastructure are common ideals of the communities (Ali, 2010). According to Ahmad (2010) the loss and deaths of Markhor in Chitral are occurring due to disturbances and variations in the local environmental conditions, possibly triggered by climate change. Communities of GB are prone and poor, they are unable to response such massive destructive events caused by climate change such as floods and droughts. They need long term projects for their capacity building and preparedness. There should be long term projects or community based disaster risk management, adaptations and mitigation enhancing activities to save life livelihoods, ecosystems, biodiversity and infrastructure of Gilgit-Baltistan.